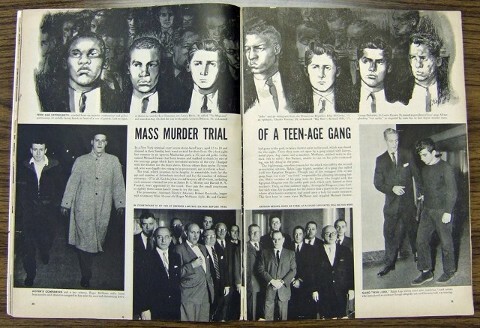 “In a New York criminal court seven boys, aged 15 – 18 and dressed in their Sunday best, went on trial for their lives. On a hot night last summer in an uptown Manhattan park, a 15 year old polio victim named Michael Farmer had been beaten and stabbed to death by one of the teenage gangs which have terrorized sections of the city. Charged with the murders are the boys above. Eleven others then under 15 years old, who were legally too young to be prosecuted, are in reform school. The trial, which promises to be lengthy, is remarkable both for the age and number of defendants involved and for the number of defense attorneys – 27 in all. Each boy has several lawyers, all of whom, including such eminent criminal lawyers as James D.C. Murray and Harold O.N. Frankel, were appointed by the court. They jam the small courtroom so tightly there seems barely room to try the case. The prosecutor, Assistant District Attorney Robert Reynolds began with testimony from 16-year-old Roger McShane (left). He and Farmer had gone to the park to take a furtive swim in the pool, which was closed for the night. There they were set upon a gang armed with knives, metal pipes, dog chains and a machete. McShane, stabbed twice in the back, ran to safety. But Farmer, unable to run on his leg, was left dying in the grass.